Today was more fun with chainsaws. Since we already got the old garage out of the way and the dumpster removed, it was time to cut down some more tree. But could I do it without a single drop of gasoline? This ugly old twin-trunked junky maple is right at where the back corner of the new garage will be. To dig the new foundation, this tree has to go. We decided that the best route would be to use some professional help for the trunk and the roots, but that also meant getting the tree MOST of the way to the ground. The idea was to leave enough for leverage for a “Bobcat” or similar power machinery to grab the trunk and get some roots to come out with it. I’d already cut down most of the tree earlier this summer. That was an adventure in itself, as the maple had long spindly branches, including one over the garage, and another that reaches the neighbor’s fence. Earlier, we took down the large pine tree. That was a bit of trigonometry, but we laid the tree down with the tip of the tree within ONE FOOT of where I was aiming. I couldn’t believe it. Not bad for just a tape measure, speed square and level to do the calculations. Today, I was by myself. I grabbed my trusty electric corded chain-saw from the shed. Using an extension cord would be a limitation if I was off in the woods, but for work in a back-yard, it’s great. No carburetors, no pull-starts, no gas/oil mixture, just pull the trigger and start cutting. I also like it from a safety point of view. With the electric, the blade starts and stops quicker and since the saw is quieter (plus no idling,) I can hear things like the tree creaking, a sign that it’s ready to give way. 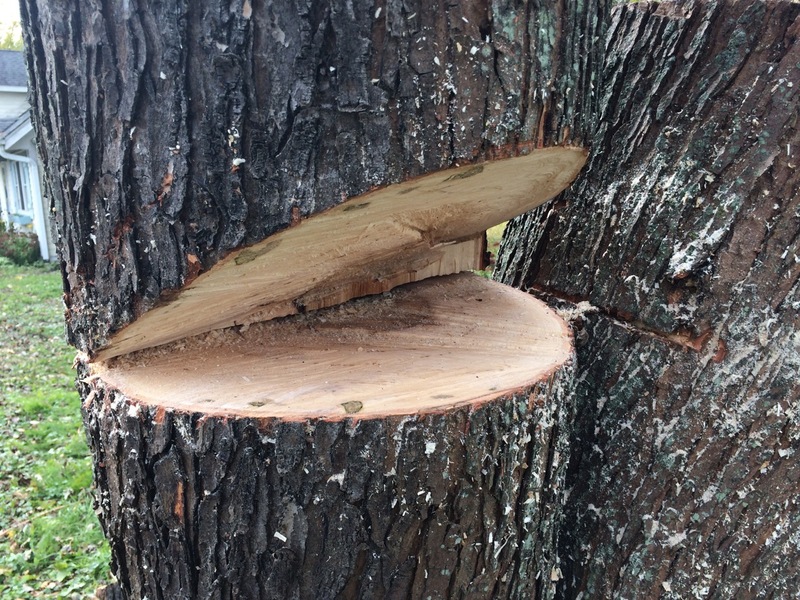 I cut the “bird’s mouth” wedge-shaped cut on the down-hill side of the tree. Unfortunately, the other half of the trunk limited where exactly I could fit the blade. Once that was done, I rolled the camera and proceeded with the cut on the back of the tree. I wasn’t able to make a great cut even with the front side, so that meant I ended up having to cut a little more from the front. THAT lead me to getting the say blade pinched in the tree. Oh well. I was already at the point of adding wedges to the back to push the tree over. So, not my finest cutting, but this was a smaller section of tree, and there was plenty of room for it to fall. Once I was finally ready, a few whacks with the sledge hammer pushed the tree right over. Now, I just gotta cut it all up into firewood. The tree guy will be coming over some time this week to tear out the trunk and roots. After that, we are getting the concrete guy here to bust up the foundation. Beyond that, the real fun starts; digging the foundation and pouring the new concrete slab! I’ll keep you updated as my solar garage project progresses. Until next time, stay charged up! It was about this time last year that we took down the pine tree. That one was about 70′ tall. The original estimate from a tree service was $2,000 to take down both trees.